Persian cavalry troops at the Caucasus front. The Ottoman–Qajar War was fought between the Ottoman Empire and Qajar Empire from 1821 to 1823. Tensions between the two empires had been rising due to the Ottoman Empire's harboring of rebellious tribesmen from Iranian Azerbaijan. Although secretly, the Russian Empire was attempting to put pressure on the Ottoman Empire, which was at war with the Greeks. Crown Prince Abbas Mirza of Persia, at the instigation of the Russian Empire, invaded Western Armenia and the areas surrounding Iranian Azerbaijan. The governor of Baghdad's invasion of Persia is defeated by Mohammed Ali Mirza who then besieges Baghdad, his untimely death ends the siege. 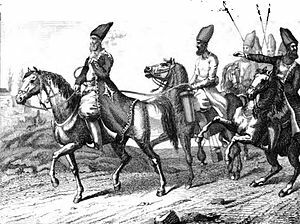 Meanwhile, Abbas Mirza marched into eastern Anatolia with 30,000 troops and met an Ottoman army of 50,000 at the Battle of Erzurum. Abbas Mirza scored a crushing defeat over the Ottomans despite being severely outnumbered and his army suffering from a cholera epidemic. Peace was not concluded until the Treaty of Erzurum two years later; both sides recognized the previous borders, with no territorial changes. Also included in the treaty, was the guaranteed access for Persian pilgrims to holy sites within the Ottoman Empire. ^ Farmanfarmaian, Roxane (30 January 2008). War and Peace in Qajar Persia: Implications Past and Present. Routledge. pp. 88–97. ISBN 9781134103089. ^ Sicker 2001, p. 118. ^ a b c Tucker 2010, p. 1140. ^ Ward 2009, p. 76. Sicker, Martin (2001). The Islamic World in Decline: From the Treaty of Karlowitz to the Disintegration of the Ottoman Empire. Praeger. Tucker, Spencer C., ed. (2010). A Global Chronology of Conflict: From the Ancient World to the Modern Middle. III. ABC-CLIO. Ward, Steven R. (2009). Immortal: A Military History of Iran and Its Armed Forces. Georgetown University Press. This page was last edited on 19 December 2018, at 02:47 (UTC).